Oncore is a free iPad app that acts as a learning management system for teachers. This simple to use app allows educators to track student behavior as well as assess students in real-time. The way this works is by uses color-coded data, to help educators visualize student's performance and help assess data. 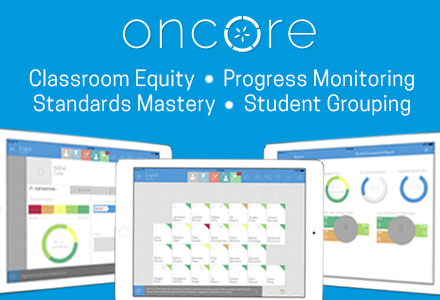 "By using the seating chart as the classroom interface, Oncore helps teachers collect color-coded, one-touch data on student learning, integrating formative assessment and feedback into their daily practice. Oncore focuses any K-12 classroom on mastery learning by helping teachers engage all students, check for understanding, create collaborative groups and communicate learning and behavior progress to parents. Unique to Oncore is its integration of Common Core and Next Generation Science Standards. Teachers can tie a standard to classroom activities, groups, assignments, or individual participations with students." I highly recommend checking out Oncore Classroom Productivity app by clicking here!!! *Oncore is an advertiser of Technology Tidbits.